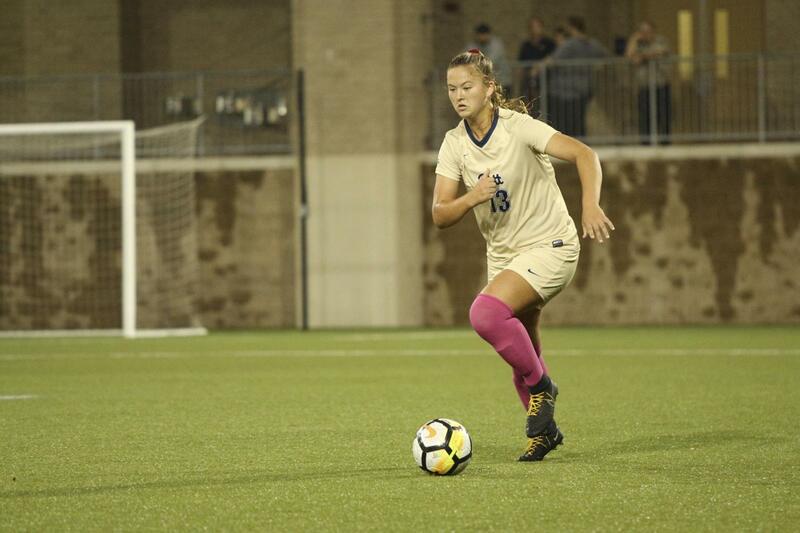 In a battle between two teams in the basement of the ACC standings, Pitt women’s soccer dropped its match to Miami, 3-0, Thursday night to move into last place in the conference. The Panthers (3-9-3 overall, 0-6-1 ACC) traveled to Miami to face the Hurricanes (4-9 overall, 0-7 ACC) with a second-to-last place spot in the ACC on the line. Coming into the game, neither team had won a game in more than a month. Pitt secured its last victory Aug. 30, against Detroit, and Miami’s last win was against Quinnipiac, Sept. 3. The Panthers had no problem taking shots in this game, as they outshot the Hurricanes 17-16, with six shots on goal compared to the Hurricanes’ seven. So, while quantity wasn’t an issue, quality was. Pitt struggled to get the ball past the Hurricanes’ 6-foot-1 goalkeeper, redshirt junior Phallon Tullis-Joyce, who used her length to stifle Pitt shots near the posts and crossbar. Redshirt first-year goalkeeper Amaia Pena received her second start of the year over Pitt’s usual goalie, redshirt first-year Katelyn McEachern. The game was physical from the start. Both teams recorded two fouls each before 20 minutes had passed. Neither team was able to find the back of the net in the first half, as the two exchanged a series of unsuccessful shots. Pitt’s best scoring chance came on a free kick from first-year midfielder Kendall Higgs in the 38th minute. After a diving effort, Tullis-Joyce got her fingertips on the ball, spoiling the Panthers’ chance at a lead. Pena kept the Panthers in the game with a save of her own in the 42nd minute. Miami sophomore Kristina Fisher broke through the Pitt defense and rifled a shot on goal, which Pena misread. She stumbled the wrong way, but stuck her foot up to deflect the ball away, keeping the score at 0-0 entering halftime. Things quickly got away from the Panthers in the second half. Miami sophomore Lauren Markwith scored with a header off a corner kick just three minutes in to give the Hurricanes a 1-0 lead. The Panthers were unable to answer despite repeated attacks on goal from junior midfielder Alli Higgs, who paced the team with six shots. Redshirt junior midfielder Ashley Moreira also took advantage of open opportunities and led the team with three shots on goal. Pitt’s deficit grew to two goals when Miami scored in the 63rd minute off a crafty give-and-go between senior forwards Ronnie Johnson and Grace Rapp. Rapp delivered the ball upfield to Johnson, who tapped the ball into the box with the back of her heel and placed it precisely for Rapp to score. The Panther defense didn’t learn from its mistakes, however, as the duo executed the exact same play for a goal in the 81st minute to put the Hurricanes up 3-0. The final nine minutes of the game played out without scoring. When the final buzzer sounded, the Hurricanes secured their 3-0 win, while the Panthers recorded their sixth straight loss. The Panthers will stay in the Florida for their next game Sunday, Oct. 22, as they look to pull off a major upset against No. 21 Florida State.